After being involved with Mind Australia’s Art Therapy Group, as a participant for two years and also being part of their Creative Writing Group for just on one year, the time had come for me to look for another way of investing myself in some form of creative outlet which would aid my ongoing post-traumatic growth; a creative outlet that would tick the happy box! 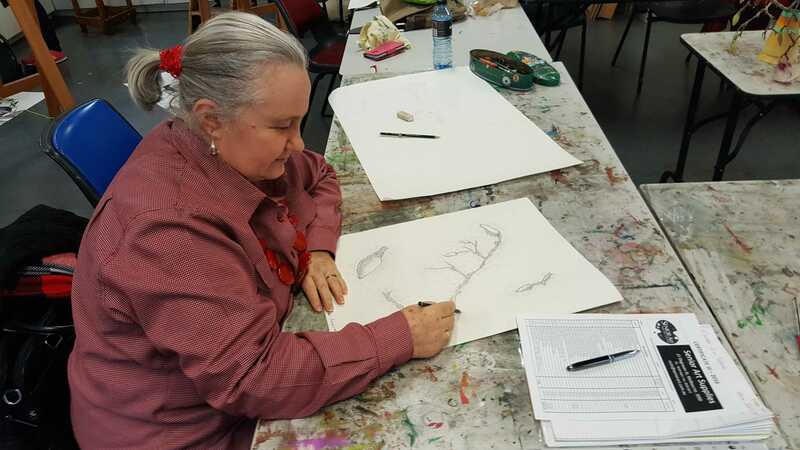 It took a number of months for me to finally reach a decision to take up an Arts Course with CAE (Centre for Adult Education) Melbourne, Australia. I have always wanted to participate in an arts course from a very early age but life got in the way, not that, that was a bad outcome, it just meant I ended up following a different path in my earlier life. Whilst I have now been, a practicing intuitive abstract artist since 2008 and have produced many paintings over those years, I still find myself wanting to participate in some sort of formal arts education. I am starting at the bottom with Certificate III in Visual Arts and only commencing with two subjects for this first semester, due to the need for having to work and also in order to keep up with my volunteer speaking with Road Trauma Support Services Victoria. CAE is located in one of Melbourne’s iconic cafe/outdoor dinning locations – DEGRAVES STREET as photographed above. Degraves Street’s bluestone cobble lane way, it’s postcard Parisian atmosphere of outdoor dining under umbrellas, and its quaint retail shops, certainly makes attending CAE’s art course each week – just that much more, an enjoyable experience! CAE states that this course will “give students the opportunity to explore a variety of art techniques and methods. Guided by practising artists students will have a unique opportunity to realise their artistic goals. Students will study drawing, printmaking, sculpture, painting, art history and theory, visit exhibitions, listen to artist talks, participate in workshops and develop an understanding of what it is to be a visual artist. Students will also further their interest in visual art and participate in classes that will teach practical skills and encourage them to develop their concepts (CAE 2016)“. After reading what this course ‘Certificate III in Visual Arts’ offered, I felt that it would give me an opportunity to: (1) expand on my existing arts knowledge base; (2) develop knowledge about materials and tools I haven’t used before; (3) work under the direction of experienced practicing artists/teachers; (4) and get to know others students with the same creative interests. 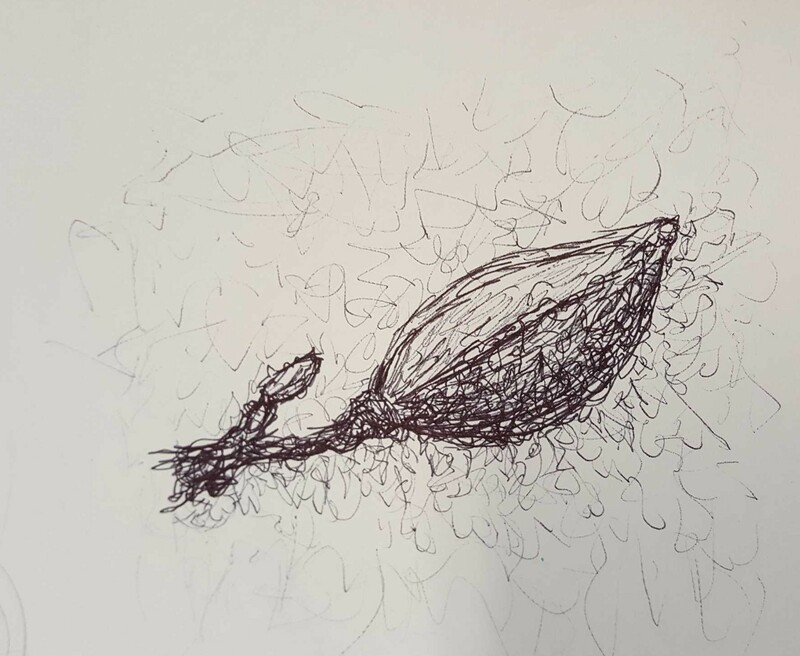 Whilst these classes are not a form of art therapy, and are about learning/improving one’s arts knowledge and skills, I do feel that they will, for me at least, aid as a form of ‘art for therapy‘ and will certainly tick the happy box which in turn will assist me, in maintaining my sense of well-being! Part of the process of commencing classes, is the process of purchasing painting and drawing arts materials. Very kindly, the painting teacher VIN RYAN took me down to the arts store Senior Art Supplies which is just below where the classes are held, to show me what was needed to start with the ‘Product Paintings’ class. Using my mobile phone, I photographed each item (see below) so that I could come back later and purchase. Also, TIM JONES the drawing teacher, kindly indicated on the arts materials list, just what I needed to purchase for the ‘Product Drawings’ class which I very much appreciated as it ensured I only purchased the necessary art items! The Senior Art Supplies store which is situated in Degraves Street, is a small and delightful place to visit, especially if you are an artist – as it is like a candy store for artists and jammed packed full of art goodies. Whether a professional, hobbyist and/or student, this store caters well for all, offering a product range which is comprehensive, consisting of artist materials and accessories such as: acrylics, oils, water-colours, gouache, easels, brushes, self-help books and more (City of Melbourne 2016). CAE states “this unit describes the performance outcome, skills and knowledge required to produce paintings through the exploration and application of a range of techniques, tools, equipment and materials. People still developing their painting skills apply the skills and knowledge in this unit. They produce finished paintings, building on and combining a range of techniques to support the ideas of the work. At this level, work is usually undertaken under supervision, though some autonomy and judgement can be expected within established parameters (CAE 2016)”. ‘PRODUCE PAINTING’ CLASS: MY VERY FIRST OIL PAINTING! I had never used oil paints before this day, so I was a bit apprehensive to start with. 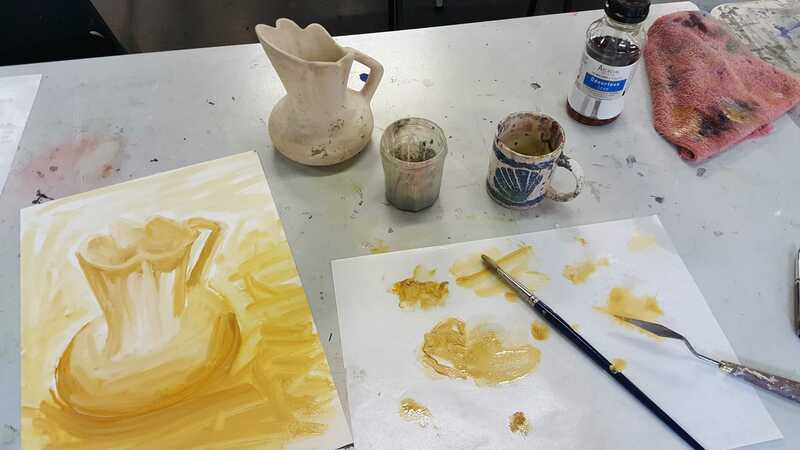 We had to choose an object to paint and I chose a shapely cream ceramic jug. This type of painting was/is very different from what I was/am used to doing and trying to understand where the light and shadows where on the object – I did find challenging. My jug painting is no master piece but an important place to start this journey! It was a good exercise in getting to understand how to use: (1) the paint brush as a pencil; (2) cleaning the brush with solvent; (3) using archival odorless Lean; (4) also thinking about colour/colour wheel variations to create depth and tone; (5) using a White Pad to mix the oil paint; (6) and apply the paint to the Canvas Paper – all which I don’t do currently within my current arts practice! It was also, a good exercise, in really observing the object, observing where the light and shadows sat on its surface. Hopefully I will develop a style of my own for oil painting, as time progresses. CAE states “this unit describes the performance outcomes, skills and knowledge required to produce drawings through the exploration and application of a range of techniques, tools, equipment and materials. This unit relates to drawing as an art form and therefore differs from units that focus on drawing as a visual representation tool. People still developing their drawing expertise apply the skills and knowledge in this unit. They produce finished drawings extending and combining a range of techniques to support the ideas of the work. At this level, work is usually undertaken under supervision, though some autonomy and judgement can be expected with established parameters (CAE 2016)”. The ‘Produce Drawing’ class proceeded the ‘Produce Painting’ class and was situated in a very similar room. Placed in the centre of the room on tables, was a row of pink Magnolia flowers, in large glass jars of clear water. It was our task to observe closely these items and draw what we saw, in detail, onto paper. ‘PRODUCE DRAWING’ CLASS: PINK MAGNOLIA FLOWERS IN GLASS JAR! The drawing class for me, was easier than the painting class, as I found myself enjoying this process considerably more. Using a HB lead pencil to draw with and applying it onto a sheet of visual diary paper, helped me just purely concentrate, on the artistic task at hand! At first I drew the whole item – being the pink Magnolias and the large glass jar. 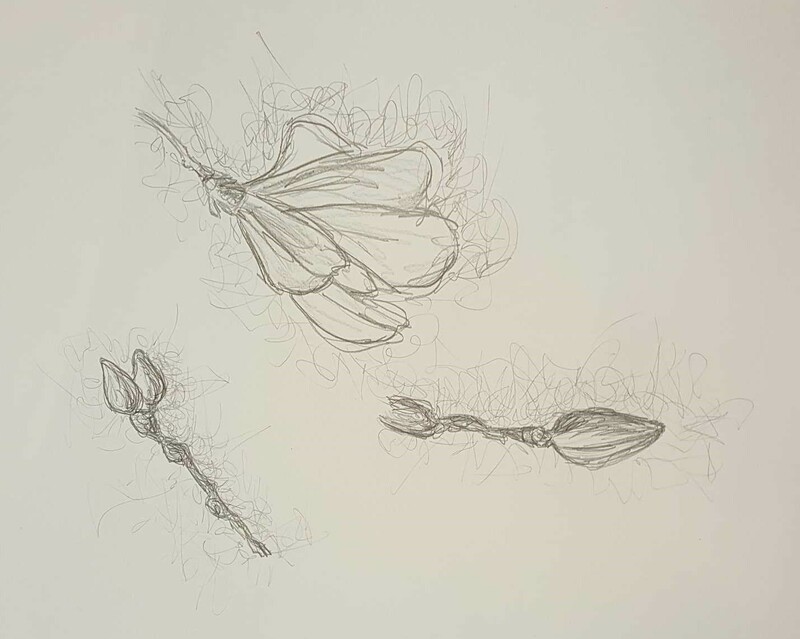 Then I proceeded to draw smaller segments, with the intent of trying to capture more detailing and to also help improve my observational skills. The very last drawing I decided to do in pen, and is my favourite out of the set that I did on this day. This entry was posted in CAE Cert III Visual Arts, My art and tagged Art, Art Therapy, Artist Blog, Certificate III in Visal Arts, Degreaves Street - Melbourne, Drawing Classes, ido art karen robinson, Karen Robinson, Painting Classes, RTSSV Volunteer Speaking, Senior Art Supplies, Tim Jones CAE Drawing Teacher/Artist, Vin Ryan CAE Painting Teacher/Artist by idoartkarenrobinson. Bookmark the permalink. Next year when I retire from teaching I’m also hoping to go back to college and take a formal art class. I’ve discovered one at the college which is within walking distance from where I live. It’s not cheap but they have a large gallery where they hang the art work that students produce and the public can come in and view it.